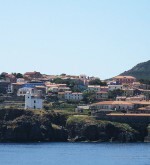 Capraia Island, located halfway between the Tuscan coast and Corsica. Very frequently from the ferry it’s possible to sight dolphins and cetaceans, especially in the expanse of sea between Gorgona and Capraia. As soon as you set foot on the dock where many people await the arrival of the ferries, the eye flows to the characteristic pastel-colored buildings or the homes built with indigenous stones of the island and can suddenly understand the most prominent aspect: it’s an island truly and unspoiled. It’s possible to bring a personal vehicle, camper or boat trailer, but keep in mind that, during the summer, the traffic is regulated: the road may be used only one hour before and one hour after the arrival of the ferry. To facilitate travel between the village and the port, there is a small public bus available. 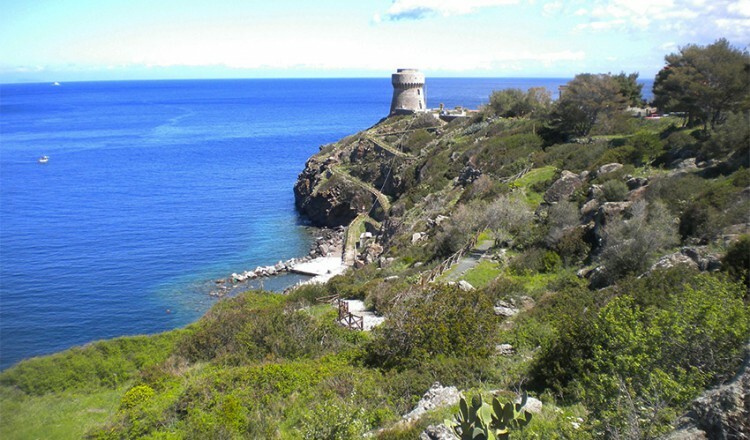 The island is rich in beautiful paths which lead through steps to nice bays of rocks or to the interior of the island in order to discover unpolluted areas. The village, situated at the foot of the Forte San Giorgio (Saint George Fortress), has maintained its original features. It is rich in art and history thanks to the many civilizations present on the island at one time or another over the centuries. Very interesting are the typical “tower-shaped houses”: three-story buildings face the village roads or look out directly onto the sea. The pergolas that adorn the walls and entrances to the homes are often laden with bougainvillea or sometimes with grapevines; the pastel colours or lovely local stone used for their exterior render this little corner of the Mediterranean quite charming.